How many Product Managers are required? Who should the Product Manager report to? Intended readers are senior management in technology companies, recruiters (internal HR and agencies) and prospective Product Managers themselves. I was a (partially) employed Product Manager for about 3 months in early 2011 in the UK (Cambridge to be precise). I reviewed job ads, spoke to recruiters and went to interviews. Having been a Product Manager in the US from 2006-9, I was appalled by the lack of understanding about Product Management in the UK. This article aims to 'raise the game' for everyone involved. Without hesitation, I single out recruiters as the profession that can benefit the most from this article. With the correct consultative approach, external recruiters can advise their clients on industry best practice and lead their clients to both the right people and to lay the foundation for the right organisation-wide processes for product management and better and more efficient product development. From there, it is a small step to better products, better and more efficient sales and delivery processes and improvement in profitability - hurrah! As a result, recruiters can gain a much greater insight into their clients’ operations and build a sustaining and differentiated value-added relationship (and generate more work orders too!). Below is a list of product management groups that are specifically set up for UK Product Managers. Others networks do exist (particularly online), but many are have an alternative bias. Declaration of Bias: I am one of the founders of the Cambridge Product Management Network. I would like CPMN to be recognised regionally as the place to meet Product Managers, for best practice and knowledge sharing and recruitment. (Note: we have no intention of turning this into a for-profit initiative. London-based 'un-conference' for Product Managers, held every 6 months or so (one was held in November 2011). MindTheProduct.com is the magazine front end for the merged entities of Product Tank and Product Camp London (see above): a blog site for authors / guest authors on product management subjects. Its Job Board costs £75 to post a job and they stay up on the site till you tell them the role has been filled. Much of this article tackles this thorny question of what does a Product Manager do. So depending on your level of familiarity, the answer may be immediately below or spread throughout this article – sorry there’s no way of avoiding this! Messenger of the Market. This is the classic inbound product management definition – a product manager acts as the voice of the customer (or market) into development. It implies the reasoned advocate of the market, wishing to solve a business problem. I also like to Story Teller of Customer Use Cases. Personally, I like ‘the person responsible for ensuring the right and complete products are built at the right time for the right markets’, as it emphasises market entry and timing and that a product isn't simply working code. Today’s software products require two different skills sets to tackle two different problems: the fundamental technology challenges and the market fit of products to business requirements. Hence why, today, this combined role has separated into its two logical constituents. There are many crimes committed under the guise of Product Management: the management of product strategy and tactics, its closely related function, Product Marketing, Marketing (and MarComms), Project Management and on and on … There’s a lot that could be added to the list – which is one reason why I love the job. Product decisions impact other business functions that Product Managers don’t control – having an appreciation of the effect of one’s decisions makes it a fascinating and continually challenging role. 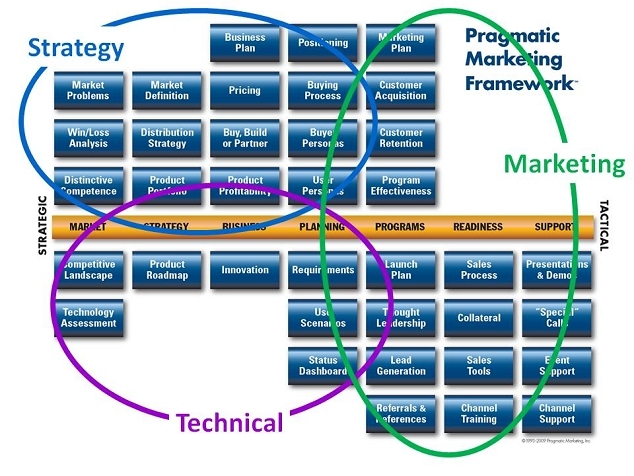 THE industry-standard definition of all aspects of a Product Manager’s function is the Pragmatic Marketing Framework (see the Framework on Pragmatic Marketing’s website for more details). 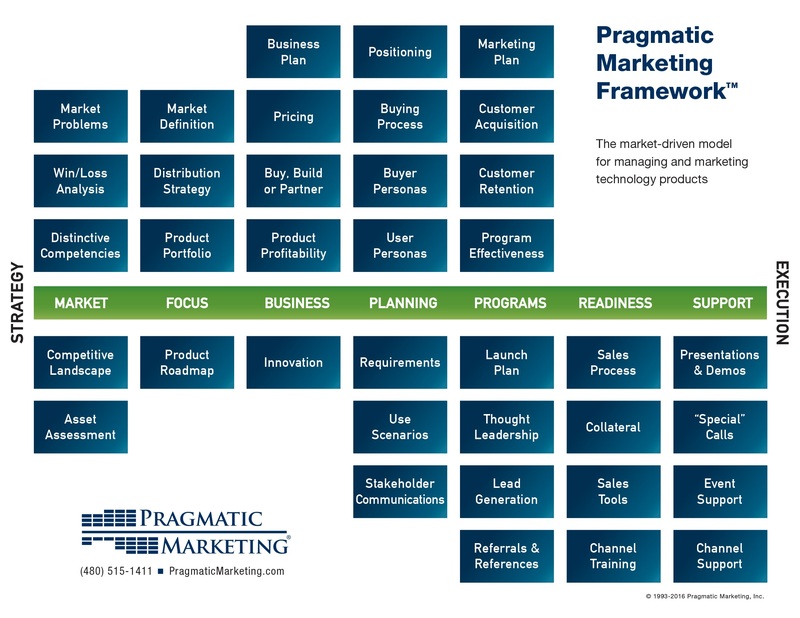 Pragmatic Marketing is the best-known training organisation for Product Managers, headquartered in the USA. To date, it has trained 70,000 product management and marketing professionals at 6,000 companies in 23 countries (Stats updated in Dec 2011). The Cambridge Product Management Network was lucky enough to have Pragmatic Marketing’s founder, Steve Johnson, speak at CPMN’s headline event in 2010: Steve Johnson on Product Management. This Framework isn’t prefect (particularly in start-ups), but it is what it says on the outside of the box – it’s a framework – it needs to be modified in order to fit into any given organisation. Product Managers in small companies (ie many of those around Cambridge, UK) need to add some project management and some marketing to this mix. Note that 'Product Management' generally refers to these three functions combined, but not always! Recruiters: uncover which corner(s) are top priority to the hiring manager and which product management functions are secondary. It is surprisingly accurate and disarming! "A Product Manager listens to the market; a Product Marketing Manager talks to the market." Rule 1: Start with a standard job description. Rule 2: Review the Pragmatic Marketing Framework and be clear which components should be emphasised in the job description. Rule 3: Be prepared to modify requirements as you meet candidates. Rule 4: Do your very best to avoid HR writing the job description by themselves. Hint: you can point them to this article or get them to contact me if you wish! Personality and cultural fit is NEVER written into the job description, but I estimate that it carries 50% of the ‘under-the-table’ evaluation of any candidate. Product Managers interface with so many other aspects of a corporation that common sense, an inbuilt understanding of different objectives of different business functions, cultural assimilation and having a sensitive corporate ‘antenna’ are essential requirements. My own search for a new PM position, I read some pretty ‘shanky’ job descriptions. As Product Management requires many skills sets that are used in other business functions, other departments see a PM as a resource that they can leverage. When other business functions are asked, ‘Can you review and amend the job description for our new Product Manager please?’, the reviewers throw in whole list of existing corporate weaknesses into the job description of the new Product Manager, making insightful competitive information. 'Experience with Whole Product Lifecycle' means that the company wants to sunset a product - which product is it?? 'Strong Project Management Skills' means that Engineering needs help with the development scheduling. A high proportion of travel can mean that the Product Management is the 'demo boy' for Sales - indicating that Sales haven't got sales engineering sorted out yet. Every year, Pragmatic Marketing carries out a survey of Product Managers. See the Compensation section in 2010 Survey, but do read the rest of the survey, as it is insightful! Natural Talent is the set of basic abilities that people seem to have possessed throughout their career or school years. It forms the foundation of what they can do and how well they do it. Artful Skills are developed and consciously honed over time. These did not usually come naturally or automatically to someone, but over time the person has learned how to use them to good effect. Bitter Experience is a real-world perspective that comes from past frustrations, limitations and failures. Except for the unluckiest among us, it takes time to build this up. Hard Work is the ability to put in a steady and sustained effort towards accomplishing a project or goal. Without it, you do not get very far using the first three factors. It makes the candidate pool much smaller. Companies that wish to recruit product managers with exact domain expertise (particularly Technical Product Managers) should encourage internal promotion or recruit directly from their customers (or possibly suppliers). It constrains product velocity to current thinking within the boundaries of existing industry norms. This encourages 'me too' thinking and focuses on competitive feature leap-frogging. This limits differentiation and moves further and further away from solving market problems. to articulate the product positioning in the marketplace. If the right product manager happens to have domain expertise, this should be viewed as the icing on the cake, rather than an essential requirement. Subtitle: the growth of Product Management function in your company. Let’s take the simple case, whereby the organisation has one product. Product Management usually starts off with the appointment of a single product manager, regardless of the size or complexity of the product(s). That person usually takes the Product Strategy and Product Marketing function, leaving Technical Product Management to be done by the Lead Architect (in the Engineering team) that should already exist. From my personal experience, then it is Product Marketing that has the most pressing requirement when initiating the Product Management function. Once the tactical product positioning and the immediate needs of the sales team (for B2B products) have been addressed, a comprehensive strategic product review (detailed competitive analysis, product road-mapping etc) can be undertaken. See the Webmetrics Case Study for a story of my own experience. As the Product Management function matures, then usually the first division in a B2B product environment is to separate Strategic Product Management from Product Marketing. 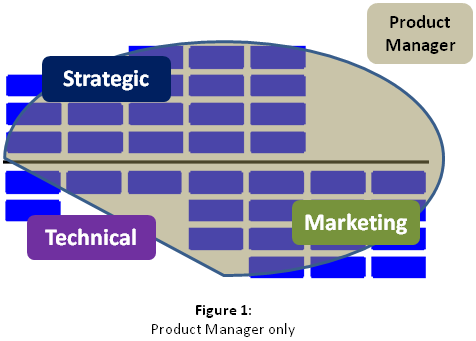 Again, Engineering usually retains the majority of the Technical Product Marketing, but the Strategic Product Management (the individual is usually called the 'Product Manager') now has some bandwidth to cover more of the Technical Product Management. Most companies have more than one product – and it is essential that each product has a nominated Product Manager. Obviously one person might be able to do several ‘small’ products. Balancing the time requirements between multiple products demands even more trade-offs – make sure your Product Manager has access to senior management for assistance with prioritisation! Frequently, there is a platform that underpins multiple products. I recommend that the platform has a (senior) product manager. The services or products that sit on top of the platform should each have their own designated product managers. 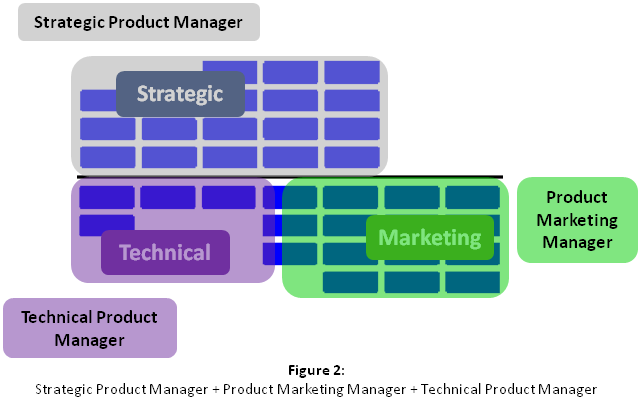 In general, the service Product Managers tend to focus on Product Marketing and positioning, leaving much of the Strategic Product Management to the Platform Product Manager. Clearly, the platform Product Manager needs to closely coordinate activities with the other Product Managers – particularly roadmaps. Further complexity is added when products have sub-products for different industries or products for different geographies – although these may be considered derivatives of the Platform + Product model. Pragmatic Marketing have an article which discusses this topic in more depth than I have: Multiple Products, Multiple Product Managers. This article discusses Product Management for B2B Products – principally because (numerically) more PMs work in enterprise products than consumer products. B2C Product Management is different: the product IS the service – and today it is usually internet-based. There is no direct sales team, so the outbound messaging and delivery is direct to the customer via the product, app or via a website. Sometimes there are distribution channels or products for particular verticals, but this is too complex to discuss here! Product Strategy becomes elevated in importance. Product Marketing still exists, but in a more junior capacity – and frequently it has Marketing-esque functions – eg search engine optimisation, social media messaging monitoring. Indeed, it may not be called Product Marketing at all – this is the territory of ‘Product Evangelist' for example. User Experience and User Interaction becomes much more important – a function that frequently reports into Product Management, as a brother to Engineering department. Using the data from the Pragmatic Marketing 2010 Survey, Product Managers, most commonly, report to CEO. If there’s a bevy of Product Managers, then the VP of PM reports to the CEO. The next most common channel is via the COO. According to the survey, the, disturbingly, 40% of PMs report to either Marketing, Sales or Engineering. These are inappropriate 'homes' for Product Management. This organisational structure creates a ‘blind spot’, frequently, the very blind spot that Product Management is intended to solve. In conclusion, the CEO or COO only please! 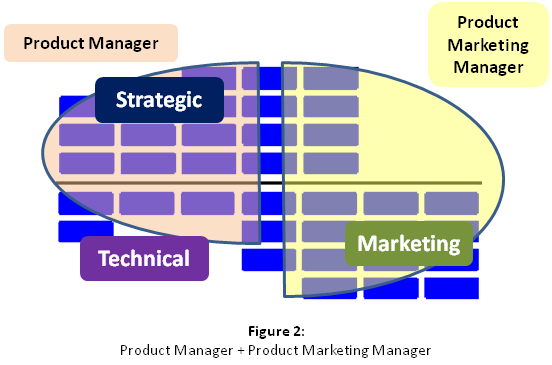 For more information, see Pragmatic Marketing’s article: Where Does Product Management Belong in the Organization?. This usually uncovers a vast mound of unresolved issues which require PM attention and (recruiters take note) frequently leads to the need for more hires. And it is the first great test of the Product Manager's diplomatic skills! Side Note: New Product Managers may find the Product Manager's Playbook useful. This is the output of a Cambridge Product Management meeting entitled 'What a Product Manager does on the first day / week / month / quarter in their new role' which I led in March 2011. Do bookmark this article for future reference. And do comment on this article or contact me directly.